Healthy ears can be indicated by clean, odor-free, pale pink color and a minimal accumulation of wax. Be sure to check your dog’s ears regularly. Some breeds of dogs are more vulnerable to ear disease than others. This includes dogs with pendulous ears or dogs with hairy inner ear flaps. Dogs with allergies are also at additional risk. Otitis Externa is an infection of the external ear canal and Otitis Media (middle ear) and is usually caused by bacteria or yeast. Other causes can be an accumulation of wax, matted hair, debris or an object in the ear. When seeking treatment, act quickly. 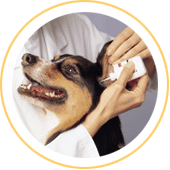 If your dog has an ear infection, he will be in considerable discomfort. Your vet will provide antibiotics for bacterial infections while antifungals are used for yeast infections. 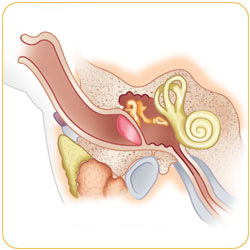 Ear infections can be indications of other problems, such as allergies, hormonal abnormalities, or hereditary diseases. Ear mites are common parasites that spread easily. This is usually from pet-to-pet. Excessive itching is the most common sign of ear mites. These parasites create dark, crumbly debris that resembles coffee grinds. Hematoma of the Ear Flap indicates blood has accumulated in the ear flap (pinna). Vigorous head shaking, itching or trauma to the ear area result in damage to the blood vessels, often caused by other infections or diseases. Deafness is usually caused by age, trauma, loud noise or infection. Unfortunately, once deafness occurs, it is a lifelong condition. Always administer medication to its full term as directed by either the bottle or vet. Always remain calm when giving medicine, your dog can sense your mood and will make the process more difficult. Always praise good behavior with treats.